These giants conifers are native to southern Chile and southern Argentina, Fitzroya cupressoides, are known locally as 'alerces'. Alerces are an endanger specie. 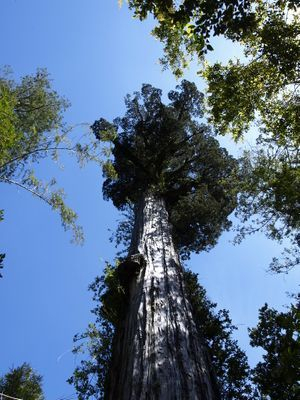 In the wild it grows to become one of the oldest and largest trees in the world. The alerce is thought to be a southern relative of the giant sequoia of North America. The oldest known alerce is believed to be about 4,000 years old. The alerce only grows one centimeter every fifteen years; however, these trees can surpass fifty meters of height and live over 4,000 years. There is a reason for them to be called “open books”, as their large grains let scientists read the climatic and geological changes that have taken place during the last few thousand years.